Artists make a difference in this relaxing Lake Michigan escape. Published on Monday, May 8, 2017. This article appears in the April/May 2017 issue of American Craft Magazine. The North Pierhead Lighthouse greets visitors in Sturgeon Bay, gateway to the Door County peninsula. The region is a haven for craft artists. Space, serenity, and opportunity have drawn craft artists to Wisconsin’s Door County peninsula for at least a century. Often called “the Cape Cod of the Midwest,” the area’s communities thrive on tourism in spring, summer, and fall, and largely hibernate during the winter. Weatherworn lighthouses are scattered along the shores of Lake Michigan, farmhouses dot rolling countryside hugged by dense forests, the region’s cherries go into everything from milkshakes to margaritas, and independent businesses celebrate and support the diverse talents of the residents. Many of the resourceful artists who call Door County home have escaped from hectic, expensive urban locales; they say their arrival on the peninsula felt like a return home, a discovery of where they were meant to be. 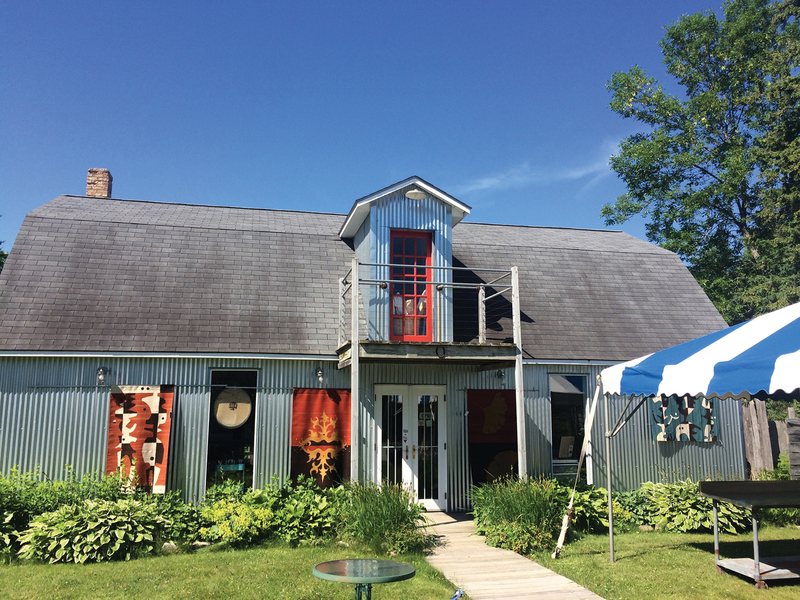 In Door County, they have found a place where anyone can turn an old building into a studio gallery, pitch a sign in their yard, and sell their wares. The couple fondly remembers their transition 20 years ago. “You find yourself going from many millions of people in the Bay Area to a town of 9,000 people, and you realize that your heart rate slows down and you’re not getting mad at people on the highway anymore,” Popelka chuckles. The couple had moved after college to the Bay Area, where Popelka studied glass and Trenchard, a painter, worked as a textile designer. They hustled day and night, taking advantage of the bustling art scene, but eventually reached a breaking point. “I was racing to a job from school and as I passed the car next to me, I recognized my children in the back seat,” Popelka says. He realized the nanny was spending more time with his children than he was. “I don’t know how I can keep this up,” he recalls thinking. The couple runs Popelka Trenchard studio and gallery from an industrial building that once served as the control center for the local shipbuilding industry. On warm days, they raise the garage door that opens their studio to the street. Whiskey, their recklessly friendly pooch, readily jumps up to greet curious visitors. 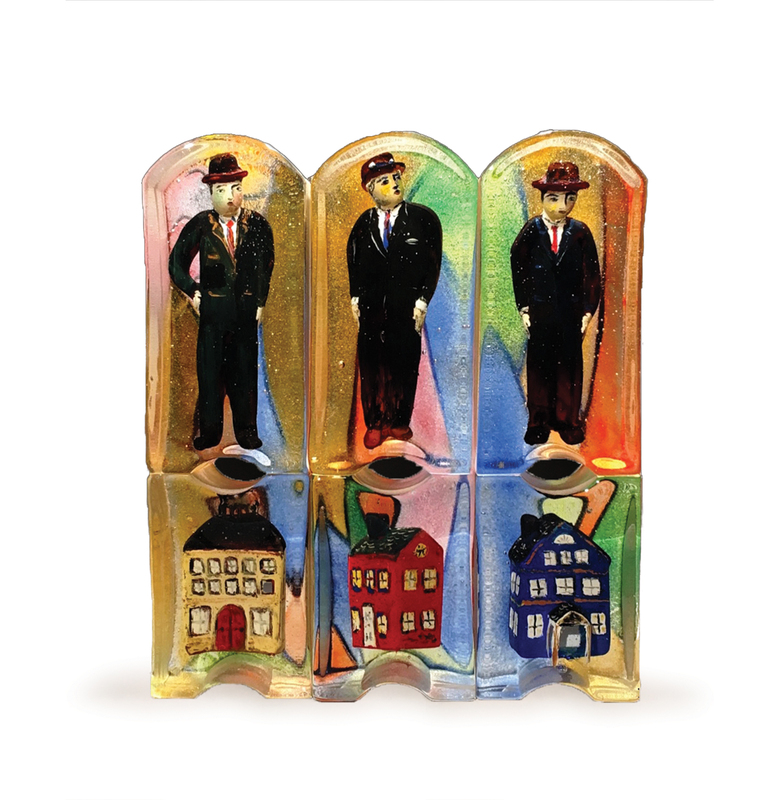 Popelka, who has an MFA from California College of the Arts, specializes in blown, murrine, and cast glass; Trenchard makes delightful glass sculptures. In their gallery, the two sell functional and decorative glass as well as Trenchard’s oil paintings. To help pay the bills, the artists also teach workshops at their studio and renowned schools such as Pilchuck and Corning. In Jacksonport, 10 miles north of Sturgeon Bay, a bright green house peeks out from behind tall pines. A sign at the end of the driveway beckons you to turn off the road and check out Martinez Studio, in a charming metal-clad building behind the home. Don’t be put off if the studio seems empty; a bell rings as you open the door, and within minutes, a cheerful Sandra Martinez will burst in and greet you like an old friend. 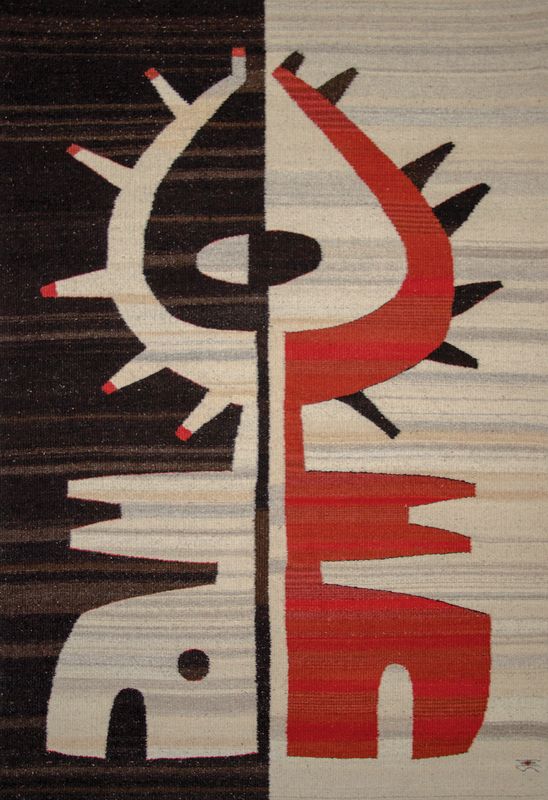 Here the painter and her weaver husband, Wence, make and sell their nationally recognized work. (They were recently selected as 2017 Balvenie Rare Craft award finalists.) On the top floor, Sandra thrives in a messy studio, while Wence’s large loom, laced with an elaborate work-in-progress, fills a tidy section of the main gallery, whose walls are covered with his work. The duo also collaborates on large, colorful tapestries with symbolic designs, which Wence weaves based on Sandra’s paintings. They exhibit all over the US, including at the Smithsonian Craft Show in Washington, DC, in April. Their art-focused lifestyle is one they’ve built following years of hard work, with Door County playing a key supportive role. This suggestion, plus a series of serendipitous events, led the Milwaukee native to the Mexican weaving village Teotitlán del Valle near Oaxaca, where Wence grew up. They fell in love immediately, and began a successful international collaboration that quickly led to marriage and family. Like most artists, they struggled to make ends meet, but the friends who helped them find each other, both Door County residents, had another life-changing suggestion. “Girl,” Sandra recalls them saying, “if you come up here, you can work like a dog for the summer, save all your money, and then you’ll be free.” The winters, then, could be dedicated to making art. The couple has made Door County their home for 24 years. Their daughter, MaLena, and her husband, Jacobo Martinez, now apprentice under Wence, carrying on the family’s weaving tradition and helping Sandra realize more of her designs in woven form. Sturgeon Bay has small-town charm, along with industrial roots and a shipbuilding history that’s celebrated in art around the city. Start at Margaret Lockwood Gallery in the burgeoning arts district to see sculpture and jewelry by local artists before catching a glass demonstration at Popelka Trenchard Glass just up the street. 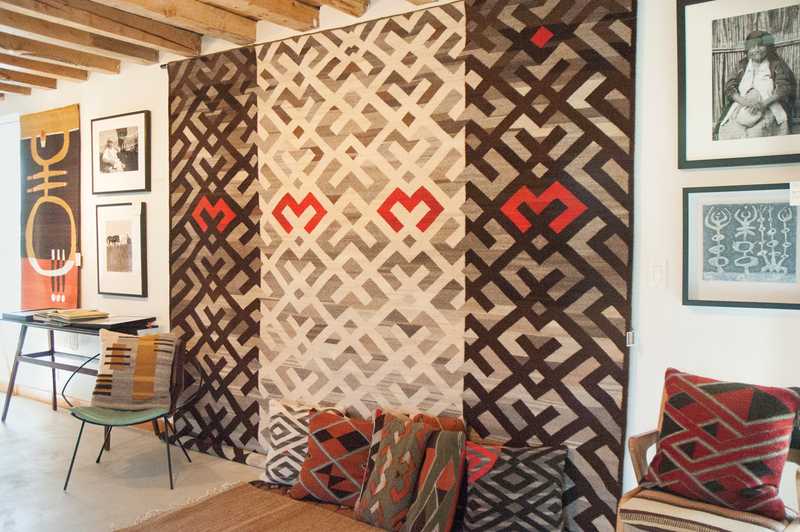 From there, head north on Highway 57 to Jacksonport and visit Martinez Studio, where you can browse tapestries by master weaver Wence Martinez and his painter wife, Sandra, along with work by notable US makers such as ceramists Ikuzi Teraki and Jeanne Bisson of Romulus Craft, jeweler Meghan Patrice Riley, and furniture maker Michael Doerr. Ceramist Chad Luberger’s Plum Bottom Pottery & Gallery, set on 20 acres, features works in clay, metal, and paper by 20 artists, as well as two cozy vacation rentals. 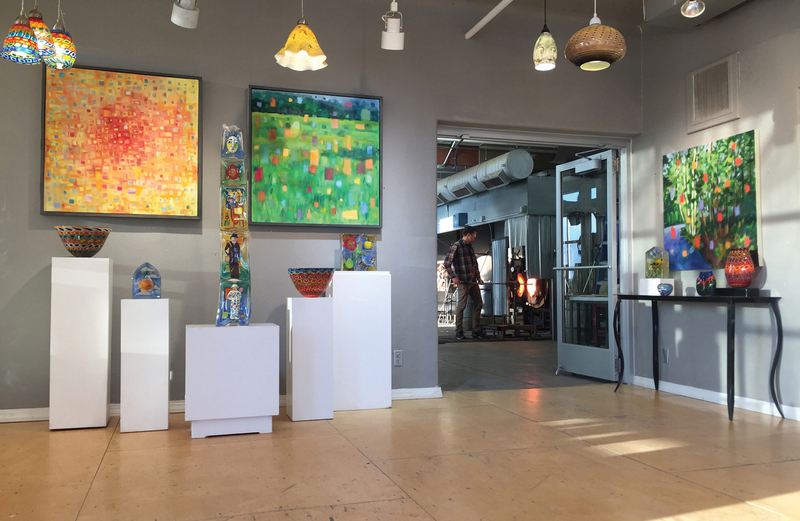 A few miles north, Cappaert Contemporary Gallery, run by painter Ginnie Cappaert, is filled with contemporary craft by regional and national artists. The gallery is housed in an 1873 log home and the back deck offers breathtaking views of Green Bay. At both locations, be sure to chat up the owners – you might get a glimpse inside their rustic on-site studios. If you’re itching to make as well as shop, the Peninsula School of Art offers workshops in a variety of mediums for all ages and skill levels. From there, head south to try the Hands On Art Studio’s family-friendly buffet of do-it-yourself projects, from mosaics to spin art to jewelry. Stop at Edgewood Orchard Galleries, housed in a 1918 stone barn. Peruse the glass, clay, wood, and metal work inside before taking a stroll through the wooded sculpture garden. A cluster of shops in this quaint community offers a little bit of everything. Blue Dolphin House and Studio has home goods, jewelry, and a garden brimming with sculpture. Fine Line Designs Gallery offers an array of fine craft and furniture. Scrimshanders specializes in the sailor’s art of scrimshaw. If you don’t know much about the art of engraved bone or ivory, stop by when resident artist Gary Kiracofe is working on his next heirloom piece. The Clearing Folk School – a place to “clear one’s mind” – offers workshops and overnight retreats in classes ranging from weaving and writing to stone-wall construction and bird watching. Or just stop by for a free interpretive hiking tour to learn about the historic campus’ grounds and architecture, then stroll through the craft-filled shop in the Visitor Center. Ellison Bay Pottery across the street and Clay Bay Pottery further south are filled with functional and sculptural ceramic work. A few minutes east by car is Turtle Ridge Gallery, where Mary Ellen Sisulak makes luxurious leather bags and accessories, with weekend art camps where you can craft your own. 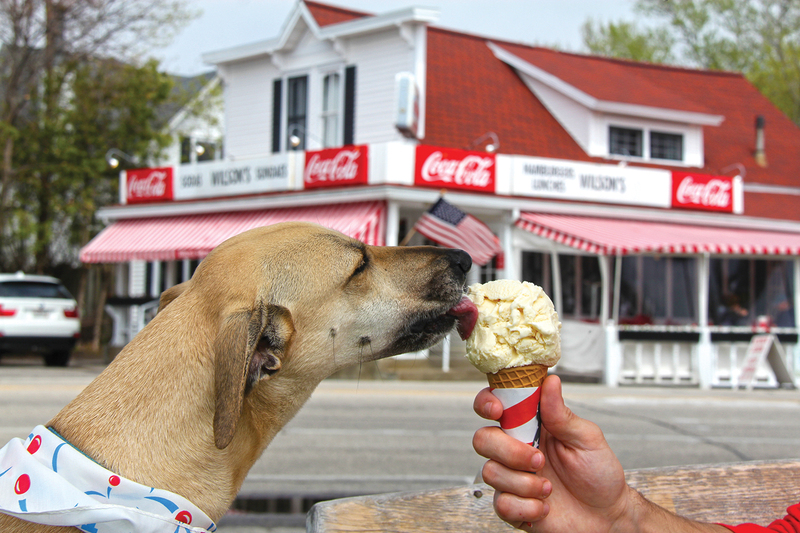 In Ephraim, ice cream from Wilson’s Restaurant, a Door County attraction since 1906, is a popular way to beat the summer heat. 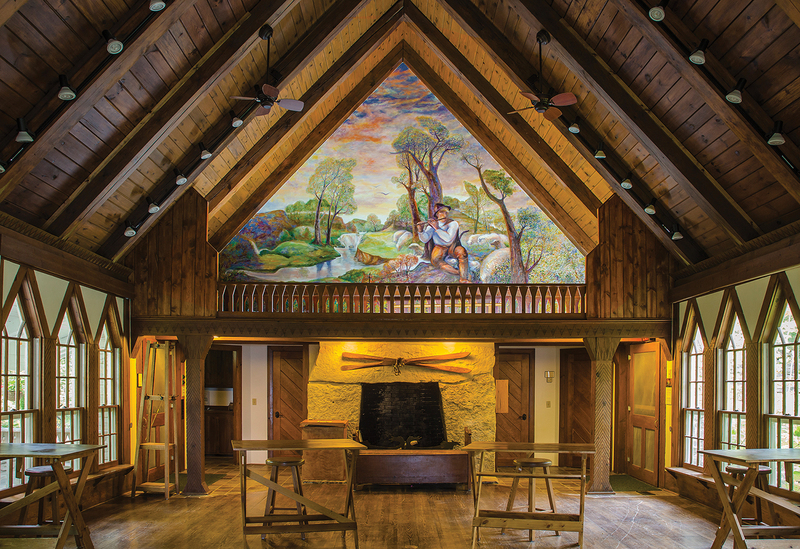 A mural by Sturgeon Bay artist Ram Rojas overlooks the Clearing Folk School’s enchanting main studio. 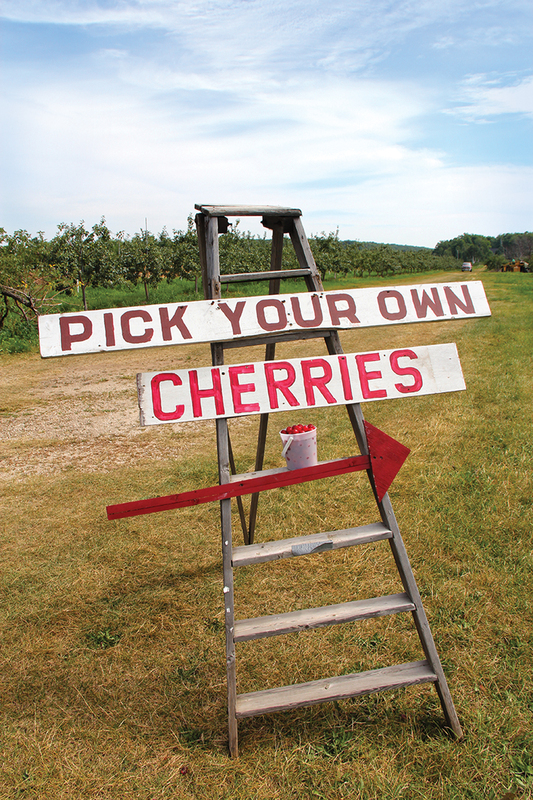 Door County is home to more than 2,500 acres of cherry orchards. Visitors can pick their own or enjoy them in treats sold throughout the region. The Martinezes turned a two-story garage into their studio gallery. Many of the area’s craft venues are housed in refurbished buildings. Conectados Codice 231 (2016) is another collaboration by the couple. Their daughter, MaLena, and son-in-law, Jacobo, apprentice under Wence, producing versions of Sandra’s designs along with other work. 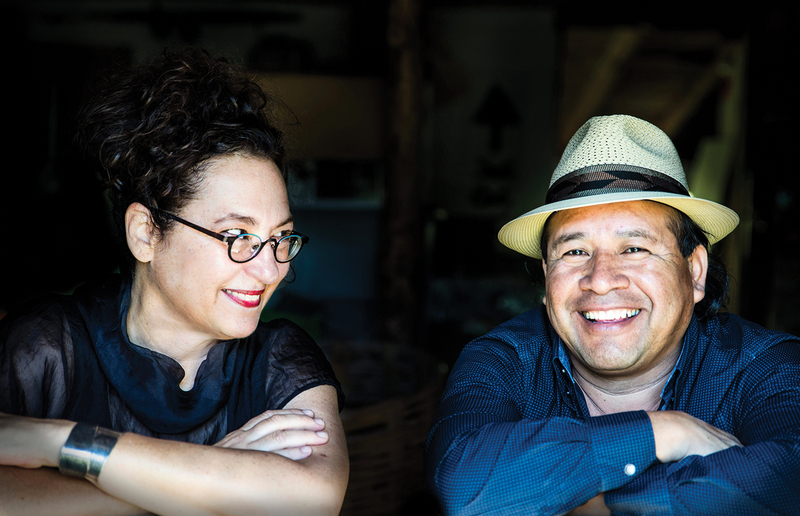 Art brought Sandra and Wence Martinez together, when Sandra, a Wisconsin native, visited Mexico to collaborate with her future husband. Wence Martinez’s Hawks (2005) graces a wall of the studio gallery he runs with his wife, Sandra Martinez. He wove the tapestry on a traditional treadle loom with hand-spun Oaxacan churro wool. He wove Tronco (2007, far left) based on a design by Sandra. 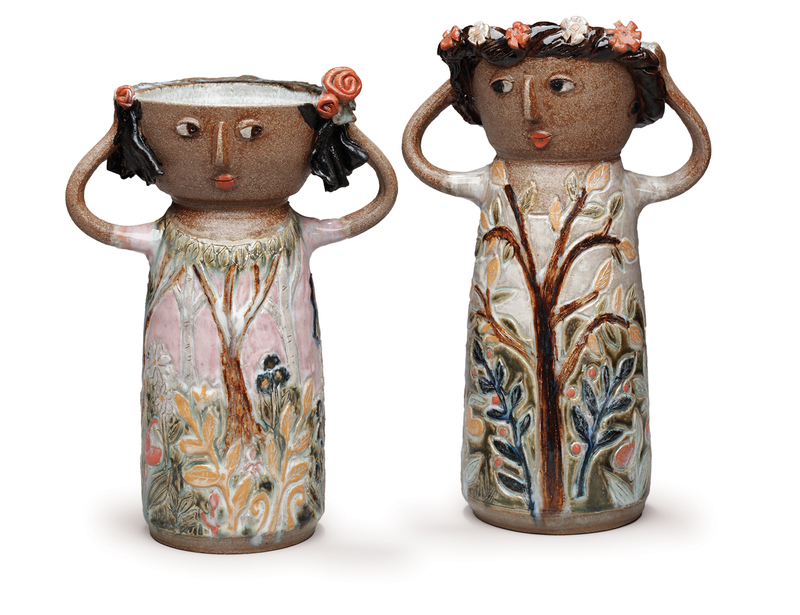 David and Jean Aurelius (her Woodland Maidens are shown above) run Clay Bay Pottery in Ellison Bay, and are active in community and school projects throughout the area. 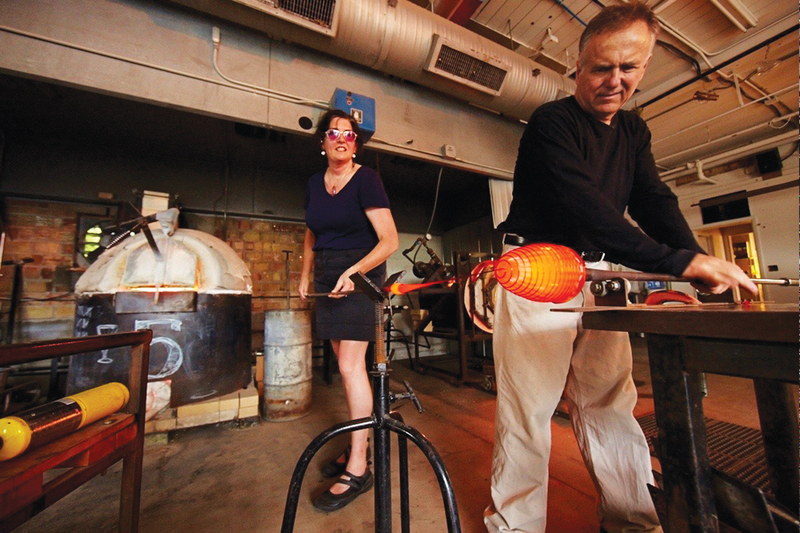 In their Sturgeon Bay hot shop, Stephanie Trenchard and Jeremy Popelka make glass art, teach workshops, and lead demonstrations open to the public. Stephanie Trenchard’s Commuters (2016) is sand-cast with painted inclusions. The couple’s gallery looks into their hot shop. An array of goods by the couple are for sale there, including abstract paintings by Trenchard and jewelry, lighting, and fine art glass. 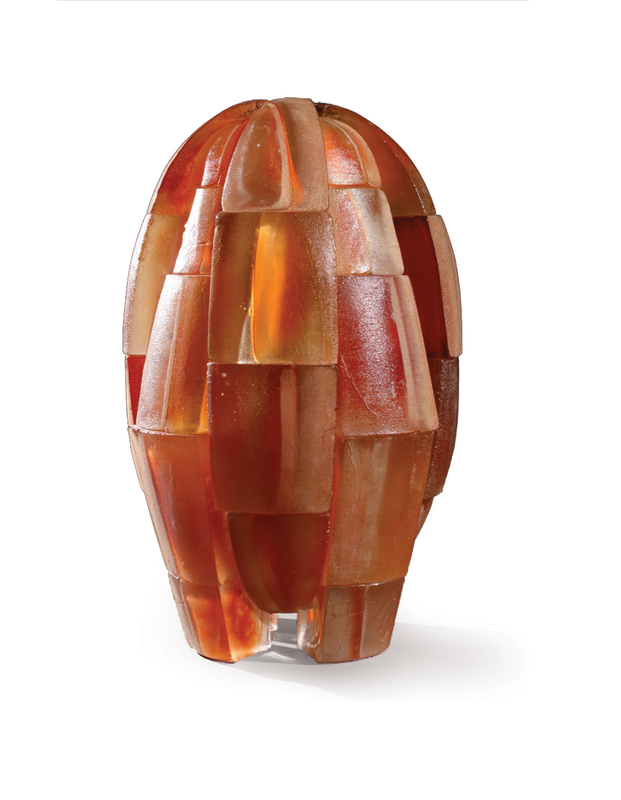 Jeremy Popelka specializes in blown, murrine, and cast glass such as Talisman (2012).